Plessy v. Ferguson, the Supreme Court case synonymous with “separate but equal,” created remarkably little stir when it was decided on May 18, 1896. Yet in its endorsement of segregation, it is a vitally important landmark whose reverberations are still felt in American society. 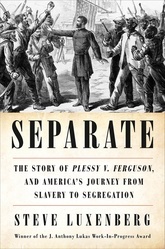 Steve Luxenberg tells the story of Plessy v. Ferguson through the eyes of those caught up in the case: resisters from the mixed-race community of French New Orleans; Homer Plessy’s lawyer, Albion Tourgée, the country’s best-known white advocate for civil rights; Southerner John Harlan, whose singular dissent cemented his reputation as a voice for justice; and many more. Separate is a fresh and urgently needed exploration of our nation’s most devastating divide.